I started reading this, and the first page got a "meh, Horatio Hornblower" from me. But a friend had said it was amazing, and I like dragons, so I kept reading. By the second page I remembered that I loved Horatio Hornblower. By the second chapter I was having guilty flashbacks (I wasn't supposed to be in the adult SF section, okay?) 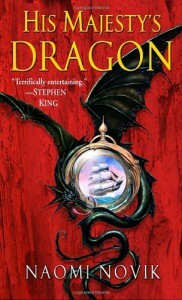 to reading the entire Pern series (which I also loved,) and then by the time the story got to dry land I had dispensed with comparisons and was just devouring the book. It's rather hard to describe the world which Ms. Novic has made, but if you really want an idea to put in your pipe and smoke, I'd say mix Pern, Ancient Rome, Master and Commander/Horatio Hornblower and a dash of Austen for class structure, and you get a general idea. Then you should read the book and marvel at how sadly my description fell short. "Perhaps not all of you are aware," he said, silencing the whispers with a look, "that England is in a very dire situation as regards the Aerial Corps. Naturally, our handling is superior, and the Corps can outfly any other nation of the world, but the French can outbreed us two to one, and it is impossible to deny that they have better variety in their bloodlines. A properly harnessed dragon is worth at least a first-rate of 100 guns to us, even a common Yellow Reaper or a three-ton Winchester, and Mr. Pollitt believes from the size and color of the egg that this hatchling is a prime specimen, and very likely one of the rare large breeds." "Oh!" said Midshipman Carver, in tones of horror, as he took Laurence's meaning; he instantly went crimson as eyes went to him, and shut his mouth tight. Laurence ignored the interruption; Riley would see Carver's grog stopped for a week without having to be told. The exclamation had at least prepared the others. "We must at least make the attempt to harness the beast," he said. "I trust, gentlemen, that there is no man here who is not prepared to do his duty for England. The Corps may not be the sort of life that any of us has been raised to, but the Navy is no sinecure either, and there is not one of you who does not understand a hard service." "Sir," said Lieutenant Fanshawe anxiously: he was a young man of very good family, and the son of an earl, "do you mean--that is, shall we all--"
... and, I've managed to rant for a page without giving you any idea of the plot. Right. Clearly I'm a great reviewer. Okay, so Captain Lawrence is Post Captain of a naval vessel in His Majesty's Navy, and they capture a French ship which is carrying a dragon's egg. However, they're so far from land that the egg is going to hatch before they can get word to the Aerial Corp. And because the rest of his crew fails- okay, sorry, they don't like the idea of being a dragon rider and all the shame that comes with it (FAIL) - Captain Lawrence steps up and harnesses the dragon. And then he learns to fly, and then he goes to land and reads about rocks, and then he goes to England, and then there are more dragons and roman baths, and there's a mid-air rescue or several, and DEVIOUS SPIES, and awesome women who are awesome and scandalous but also awesome, and many battles, and invasion by the TRICKSY FRENCH, and acid-spitting dragons, and officers who are fools (I can't tell you how much this pleased me,) and officers who are awesome, (also, I was delighted, though not as much as by the incompetents. Sorry world,) and plot twists, and treason and references to Newfoundland, and SUNDRY WONDERFUL THINGS*. I cried inside when the dragon died. Go buy, beg, borrow or steal a copy, and read it. You won't be sorry. *I really push the envelope for coherency with these, don't I?